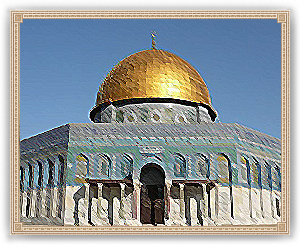 The Dome of Rock is a building that the Muslims, Christians, and Jews alike consider one of the holiest places of all time. And like most holy places, it is located in Jerusalem. Within it contains a rock, which Muslims and Jews venerate. To Muslims it was there that Muhammad had ascended into a journey to heaven with Gabriel. To Jews, it was upon this stone that showed Abraham’s faith to god in the willingness sacrifice of his own son. To Christians, the spot where the dome was made originally housed the Church of The Holy Wisdom. It is, as the name implies, a massive dome and was ordered by Abd Al-Malik ibn Marwan. Though the Christians occupy Jerusalem, this holy building is one of the main reasons, or pretexts to retake Jerusalem.